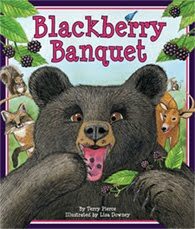 Blackberry Banquet has been named to the 2010 California Collections. The book list is compiled by the California Readers (click here for full list). Listed books must display “excellence in literature” and be written or illustrated by a California author or illustrator. I’m proud to be a part of the California Collections once again (Tae Kwon Do! made the 2007 list). Thanks, Barbara Jean. No, I hadn't. Too busy singing kudos to some of our other members :-). Woohoo! So exciting 🙂 We're so proud of you here at Sylvan Dell. Keep up the great work! Thanks, SD! Maybe this will be the first of many!